Air pollution in the North continues to be critical, with small dust particles of 2.5 microns in size (PM2.5) exceeding safe limits at almost every air-quality testing station. The Government Savings Bank (GSB) says the country’s gross domestic product (GDP) is likely to grow 4.1-4.6% this year. The Food and Drug Administration (FDA) has recalled and destroyed substandard rabies vaccines, which have been partly blamed for the current spread of rabies, in late 2016. Authorities project tourism income to grow by almost a fifth during the Songkran holiday. A total of 157 malfeasance cases concerning state officials will go to court, the National Council for Peace and Order (NCPO) says. At the ASEAN-Australia Special Summit in Sydney, the Thai Prime Minister has highlighted the importance of connectivity in infrastructure, transportation and anti-international terrorism efforts, in order to ensure regional security. The clock is ticking for Thailand as it cleans up its fishery business before European Commission inspectors arrive next month to check its progress in dealing with illegal fishing and forced labour. The road to Thailand’s first “unicorn” (a start-up worth US$1 billion) is still very long. Currently, the top 10 start-ups in Thailand combined are worth less than a single unicorn, although there are already a few start-ups worth that much in Singapore, Malaysia and Indonesia. The Department of Energy Business (DOEB) plans to increase the proportion of palm-based biodiesel to absorb the surplus in crude palm oil. The Ministry of Commerce has instructed the Department of Internal Trade to keep a close watch on price of goods in the wake of the wage rise slated to apply from next month. Thailand’s biggest convenience store chain, 7-Eleven, is to roll out state-of-the-art artificial intelligence technologies, including facial and gesture recognition and behaviour analysis of customers and employees, at the chain’s 11,000 stores. Authorities have continued to offer rabies vaccinations across the country in an effort to stem an outbreak of the disease. A Qatari man and a Thai woman have been arrested in the Bang Lamung district of southern Thailand for allegedly robbing a jewelry shop before fleeing the scene with gold worth more than $800,000 (3 million dirhams), according to the Bangkok Post. An executive of a business accused of profiting from “zero dollar” tours has been arrested at a house in Taling Chan district of Bangkok for alleged tax evasion worth at least 7.7 billion baht. Transport Minister Arkhom Termpittayapaisith is confident the remaining four rail construction projects will receive cabinet approval this year. The Bangkok Metropolitan Administration (BMA) has assured the public of the effectiveness and quality of vaccines being used to contain the outbreak of rabies in some areas. A majority of people want new political parties to form a government after the next general election — and Gen Prayut Chan-o-cha is the most popular choice to be prime minister, according to an opinion survey by the National Institute of Development Administration, or Nida Poll. 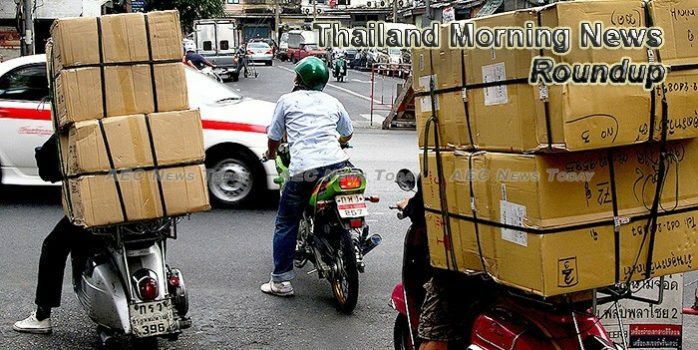 THAILAND SAYS IT IS TRYING TO PROTECT MIGRANT WORKERS. SO WHY ARE THEY ALL SO WORRIED? Sai Tun Shwe is a worried man. After 13 years in Thailand, nine of them working at the same garment factory, his work permit is about to expire and for the first time he is unsure if he will be able to renew it. The Election Commission (EC) has stated that Gen Prayut Chan-o-cha can be a member of a political party without having to give up the post of prime minister. Red Planet Japan Inc., the Tokyo Stock Exchange listed subsidiary of Bangkok’s Red Planet Hotels, Friday announced a $111 million (JPY 11.77 billion) sale-and-leaseback transaction with global investment bank Goldman Sachs. The Department of Foreign Trade announced this week that Thai rice exports will reach 9.5 million tons this year due to stable high demand in the global market. Following the complaint about wastewater in front of the Fisherman Way Village in Rawai being released into the public water in Chalong Bay, Phuket’s Governor has announced that Rawai Municipality is preparing to spend 30 million Baht on building a public water treatment lagoon. WHILE MANY Asian countries have discussed the “post-truth” political phenomenon in the social media era, Thailand appears to be a few steps behind as it struggles with freedom of expression in an undemocratic atmosphere, a symposium heard on Friday. Prime Minister Prayut Chan-o-cha met Saturday with Australian Prime Minister Malcolm Turnbull to strengthen a bilateral trade tie. NEW POLITICAL parties and fresh faces often emerge ahead of a general election but only a handful of them actually succeed. At a time when cryptocurrencies are becoming much more regulated, it is not surprising to learn that Thai regulators have reportedly agreed to enact two laws on both cryptocurrencies and initial coin offerings.